Any script editors, server managers, online indicators go here. ServerConfig is a free tool for automatic configuration whit your rAthena Server. Just 4 click and your server are ready. 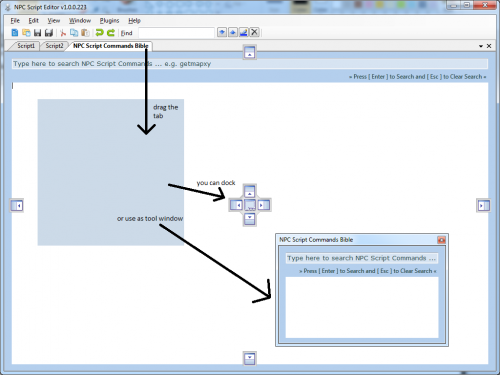 3° Click Detect in IP Address configuration, or put ip address in this filed. After patching, you can test if your roter Port are enabled. Plase report bug or error. Hello everyone. Many ask me how I translate my item_db with my iteminfo, so today I came to teach how to do it. 1 - Download the program that I made available. 2 - Replace iteminfo.lua inside content with your iteminfo.lub or lua content. 3 - Run the program. 4 - A file named item.txt was generated. 5 - Copy the contents of this file and now into ServerDatabaseEditor, click on Tools after loading your database and copy all contents of item.txt and after that click on Run. 6 - Okay, you just translated your item_db into the language of your iteminfo! also your progression shifts towards equipments and classes. 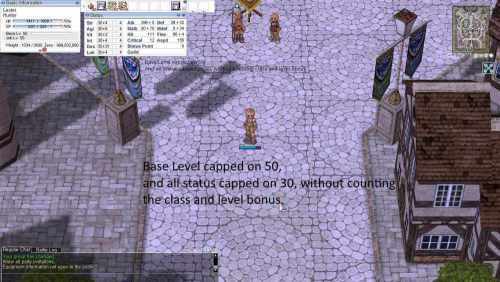 is actually a end-game instance, because the monsters there has absurd status, most likelly because of the sum of their status values. built a client for that yet, so basically It's a "test at your own risk" in that case. of quest npcs or event npcs, or else the game will be boring quickly. The instalation guide is inside the zip file, and enjoy. 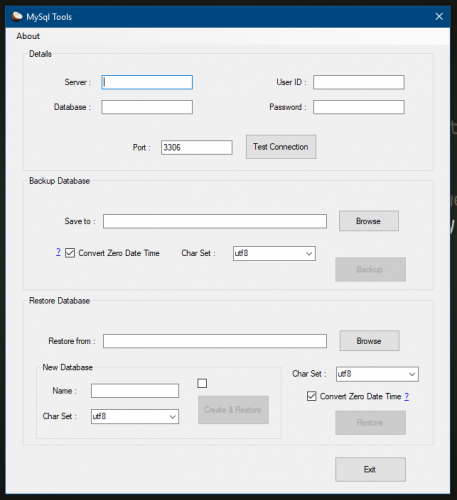 I would like to share one of my simple and small program that i used to backup SQL Database. I am new in making programs as i am learning it in school together with php, so i hope you guys can pardon my noob code. It been created to help my dad and brother to backup their mysql database remotely. Now i would like you guys to try it and give suggestions on the programs. The field in the programs need to be write manually as that is what my dad and brother requirements. 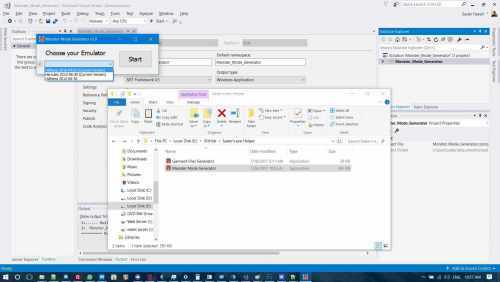 using .net 4.5 slightly change the way backup is save (using only .sql) added restore function with create database option (create database function will only create to a non-exist database) change how the connection been to the MySql server is made The guides will be updated later. p/s : If you would like to take a look or use the source code, it been upload to github. Please comment about the source so i can improve the way i write the code. Thank you. It allows you to quickly populate new groups. 1. Download and unzip the tool. 4. Insert your GROUP_ID to use in the First textbox. 6. Add the minumum and maximum value. 8. Now the bottom box will output the combination of all your options chosen and it will min/max the values. I want that the Item option roll 1000 or 2000 HP and 100,200 or 300 SP. - PHP version 5.4 and up is required to run this script. - If the value is NULL, type it in small letters. - Use quotes on string values. - Do not add commas on each line. Create a new project from File > New project. Go in the settings tab and set the path of your database. If you're using pre-renewal, then drop the pre-re folder in the "Server DB path" box (drop the re folder otherwise). Don't drop your "db" folder, it simply won't work! There are multiple ways to save the database : quick save, full save and export. Quick save keeps the commands you've applied on the database (Ctrl-S), this is the saving option you should be using. Full save (Ctrl-Shift-S) does not keep the commands and you will not be able to undo any operations afterwards. Export (File > Export to db/SQL) exports the database to another folder and this is normally used to convert databases. If "Synchronize with client database files" is checked in the Settings tab, you'll be able to turn on all the following features. This feature enables you to quickly alternate between the Item and Client Items tabs. Whenever you switch table, it will autoselect the item previously selected. 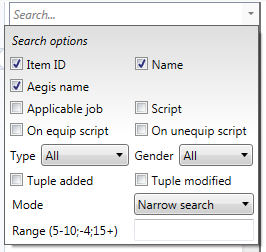 The text search filter will also be applied to all three tables (Item/Item2/Client Items). Subfilters (such as item description, script, etc) will be ignored if the item isn't included in the search result. This feature allows you to completely ignore the view IDs for headgears and costumes. Only the identified resource's field is taken into account when synchronizing with the client databases, so make sure you set at least this field! You must also set up the lua paths; go in any item table and click on the wheel next to the "View ID" field. This will bring up a dialog to setup the paths (preferably, the files should be located in your data folder to avoid saving the GRF all the time). They will be automatically decompiled if necessary. If everything has been properly set, the View ID field for the headgears and costumes will be grayed out. When saving, you'll notice some view IDs will be switched around, but SDE will try to keep your original IDs as much as possible. The view names will be changed to the item's Aegis Name (has no effect ingame). In the mob tables, you will find a wheel button, similar to the view IDs. Setting up the paths will allow you to see the mob sprites as they will appear ingame (except for granny models, like emperium for instance). The "..." button can let you select the sprites from the mob folder in the GRFs (or data folder). With the client tables synchronization, the preview image for items in the list view will be properly displayed. This is handy for custom items. Import from SQL (is that even necessary?). Automatically create a table from a file. Batch files / command line methods (would be similar to GrfCL). Known bug : exporting mob_skill_db from Hercules to SqlRenewalHercules doesn't seem to be parsing properly (for this file only). Type safety (check for invalid inputs, use the same SQL rules when loading the databases). Hope you enjoy this tool! The sources will be available on githut for the next release. If you have a feedback or suggestions, let me know and I'll probably add them to the software. 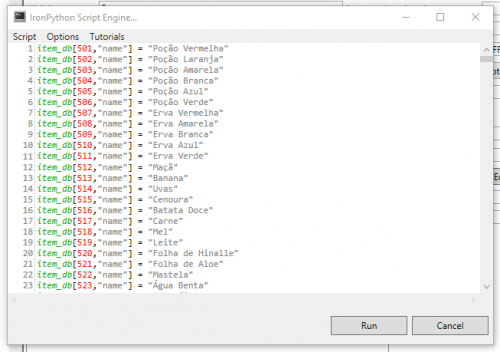 Easy to use & feature packed NPC Script Editor for RO emulator(s). Has a built in plug-in system, so anyone can write their own plugin to extend this editor's feature. Now optimized for performance and support NPC Script Parsing / Syntax / Error checking (F6) right in the editor to speed up your coding. Yggdrasil Manager is a Ragnarok Serveur Manager (yes another one). It's written in C# (4.5 for client and 4.0 for server) and compatible with Mono (at least 2.10) wich means you can run it under Unix type OS(only the server part, the client part is made for Windows only). I had it run under debian Squeez and it worked like a charm. It's a client-server application wich means Manager and Monitor do not have to be on the same computer. The Monitor handle all the "server part" wich is starting, stoping, kepping the status (online, offline, maintenance), sending the console output to the monitor and some other stuff. The Manager allows you to see the console output of your servers(login, char, map), start, stop, restart them and even put the login server into maintenance mode(we will see what it that a little further). You can also see how many players are connected without having to log into the game. Basically it's the "UI" part. Manage classic setup with login, char, map. It's the basic configuration that almost every one use. .Servers have a auto restart function that you can enable or disable, logins servers can be put into maintenance mode, wich means that only account with group_id > 1 can log into the game. All you have to do is click on a button. Console ouput is colored the same way the rathena one is BUT you have to enable "stdout_with_ansisequence" in the conf file. Please note that this is a first release, it should work out of the box but nothing's perfect. More features are comming as soon as I found new ideas xD. But you can post yours here . After that, you need to setup your server, click on the settings icon and configure it. Restart the monitor and your done ! Simple to use rathena/eathena server manager turns on/off autostart @ startup and minimize to tray function with low RAM use. Enabled logs. take the files (POWRO and the .OCX files) and put them in your rathena/eathena root folder. Run the POWRO and configure it with your server .exes. If there is still interst in this project, and you really would like a update with better performance. Write me a private message. I would like to renew this, but i dont have any server to test it. Also if no one want a new version, i dont see any reason to rewrite it. This application is made for windows servers, since it doesn't make much sense to have something like this on a linux system. Login-, Char- and Map-Server gets started without a window. All Output is redirected to this application so you can see all 3 windows in 1 application. Version 2.2.6 is really old, but still have some "nice" features like coloring of [info], [status], etc. 1. Download the newest Version. 2. Unrar it & Place it where you want. 3. Start the Application and go to "Options". 4. Configurate the Path to your executables. I'm sorry. This project is by the time i changed this, about 4,2 years old. After cleaning my github i deleted it without thinking about it. It has been reported in many places that phpmyadmin has trouble dealing with comments in large sql files that are being imported. I recently ran into the same problem while impotrting the huge item_db sql file to my server's database. So here is a solution/ workaround I made to solve the issue. I wrote a small program in c# to take in the Text version of the database and convert into a CSV file. Importing this CSV to the db works without a hitch. The program only converts item_dbs and mob_dbs. Not all possible file errors and irregularities are handled. If the text db file works well, the conversion should go well. For those thinking of importing the item_db.txt as CSV, you need the item_db's structure set-up. There are 2 ways to do it. (Easiest) Import item_db2.sql first and then copy the table's structure as a new table i.e. "item_db". To do this goto the item_db2 table and click on "Operations" tab. Then, select the "Structure only" radio button and give the name as "item_db". Click "Go". Attached in the archive you will download is a sql script to create the item_db structure. But beware that it will also drop the item_db table if it already exists in your datatabase. The item'o'lupus allows you to manage your item_db.txt and item_db2.txt files. When you run the program you will need to select the item database you wish to read. Upon opening it you can easily make changes to the properties of the item visually. Formatted as an html file. This is my first version of MobDB.txt edittor. Im not very good in C#.net programming so you may find some bugs or errors. If you found bugs or errors or you have some suggestion kindly report it to me. This project is written in C++, using Qt ( So the code is platform independent, and once I reach Beta I plan to release both the source and linux binaries ). Feel free to post your ideas. Script editor for item's scripts. Blur the borders between the files. Double clicking an entry loads that entry to edit. If you fill the ID field and press return, if such entry exist, it will be loaded and selected. Save button save only the entry, use file->save to save the dbs. If there is an entry exist with the saved id, it will be overwritten, otherwise appended. Hello all, I just recently made this program in order to Help with some of my scripting structure, instead of having to deal with typeing out all those lines or opening that other program eascriptable, with this i can just run the program type in the info and it saves it as a txt file in the directory specified with the structure all laid out. If anyone has any suggestions im free to hear them and if this kicks off i'll develop it more, i have a few ideas in my head, Customizeable Quest Scripts through gui and such :3.